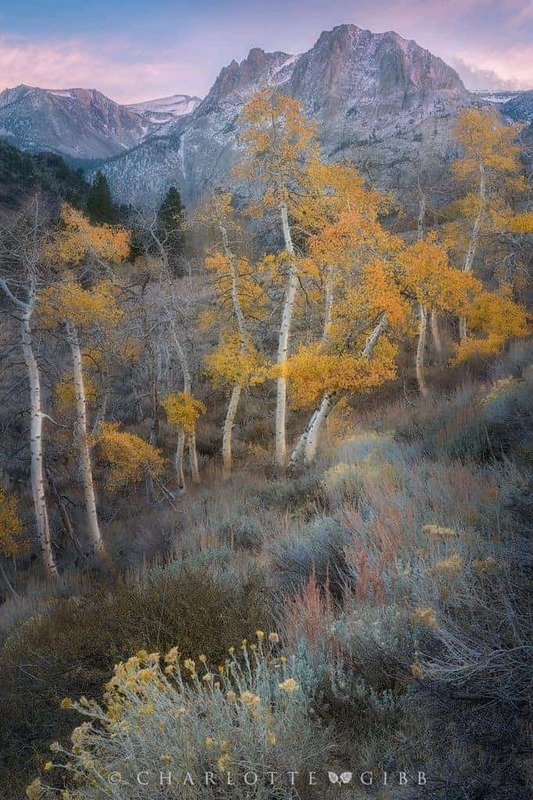 “Aspens and the Blue Light”, Oct. 21, 2013, Eastern Sierra, California. Canon 5D Mark II, Canon 24-105mm f/4L lens, 105mm, ISO 100, f/18, .5 sec. Autumn is the time of year when those of us in the Northern hemisphere flock to beautiful locations to photograph the vivid and changing foliage. We love the shorter days that allow us to sleep in a bit longer, and the extended Golden Hour that gives us more time to be creative with beautiful light. But, we are overwhelmingly drawn to the trees, with their striking shades of yellow, orange and red, reminding us that nature is cyclical, and that we are part of that cycle as we also prepare for the approaching Winter. 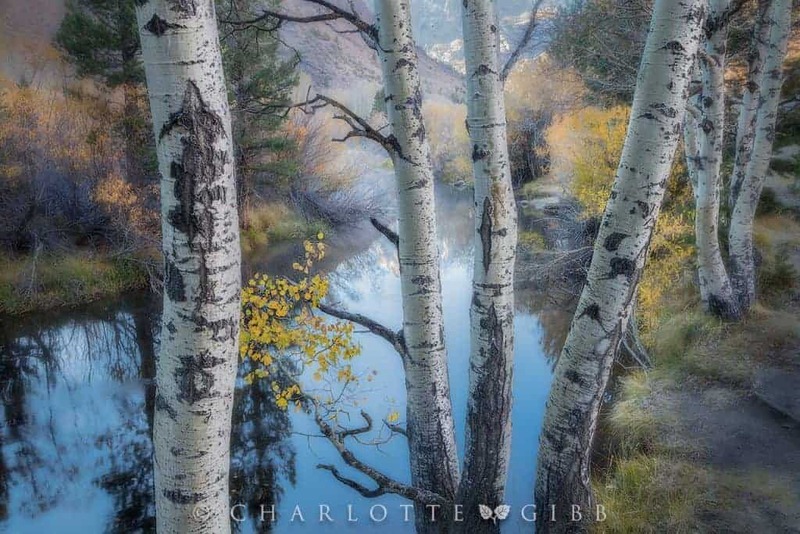 For nature photographers, the annual migration to witness the arboreal color transformation is a tradition that binds us together with shared enthusiasm. 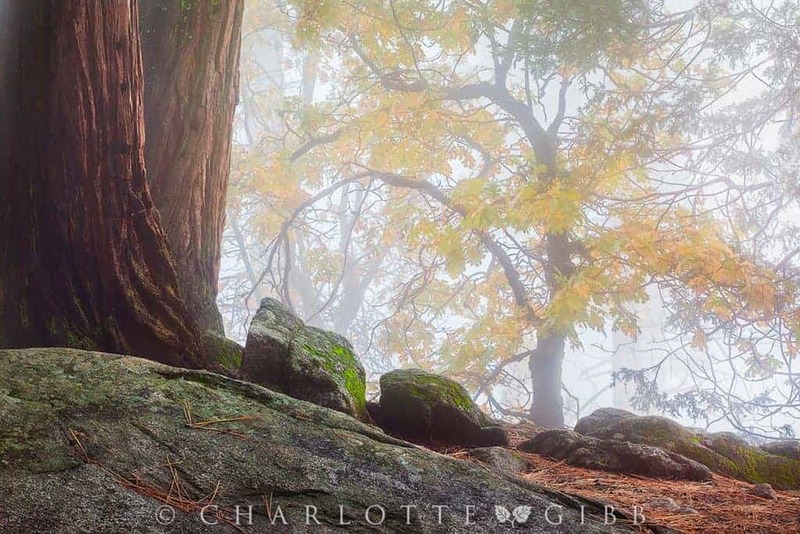 How can we make our annual Autumn photographs more creative and engaging? Here are some thoughts and inspiration as you ready for your autumnal journey. 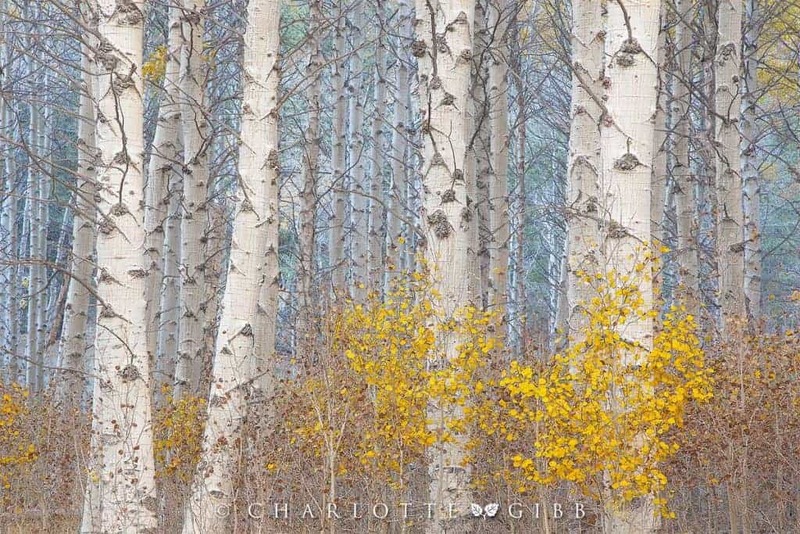 “Towering Aspen”, Oct. 17, 2017, Eastern Sierra, California. Canon 5DsR, Canon 16-35mm f/2.8L II lens, 16mm, ISO 320, f/16, 1/160 sec. It can be disappointing when nature doesn’t serve up what you want. I get that. But, try to keep an open mind and appreciate the conditions that are before you. Did you miss the peak color? 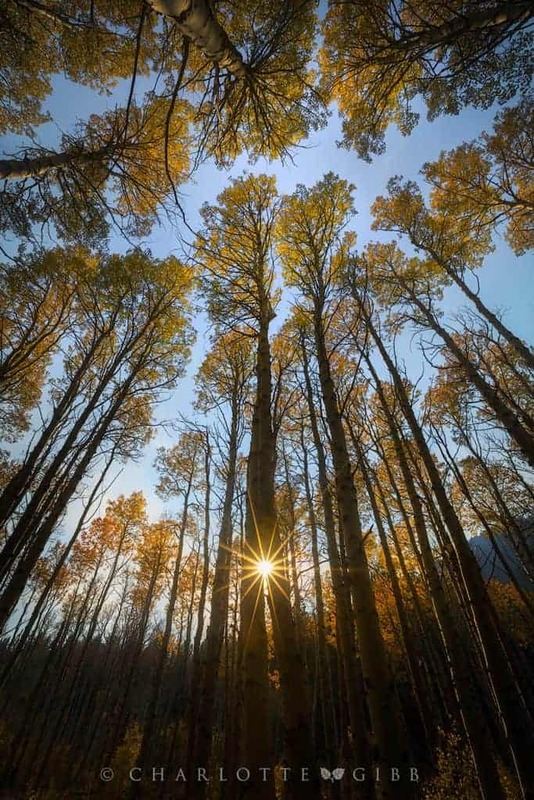 Photograph the structure of the trees, with a few lingering colorful leaves. Is it raining? Great! Rain can accentuate the rich colors. If you are lucky, you might even get a rainbow! Windy? Try playing with a slow shutter speed to communicate the dynamic motion of the trees. Is it cloudy? Fantastic! Overcast conditions bring out more subtle, gentle colors and eliminate harsh shadows. Freezing? Look for frost and textural aspects. Snowing? Lucky you! Fall foliage is even more lovely when combined with falling snow. Nothing but sunny, blue skies? Try a sunburst or backlit leaves. Hard expectations can lead to disappointment. Try to look beyond what’s expected and discover what else is possible. If you learn to embrace whatever nature has on today’s menu, you will expand your creative toolbox, experience greater delight in the process, and make more compelling and unique photographs. 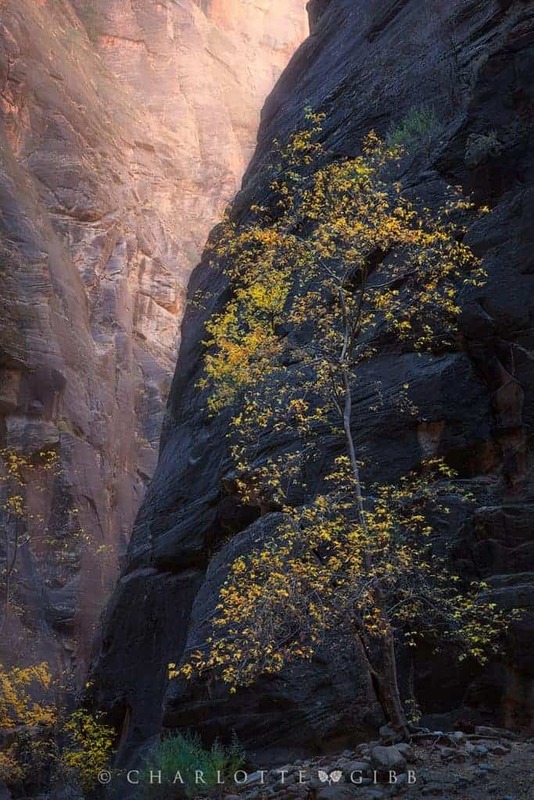 “Zion Gold”, Nov. 1, 2017, Zion National Park. Canon 5DsR, Canon 24-70mm f/2.8L II lens, 53mm, ISO 100, f/16, .6 sec. A big part of nature photography is, well, being in nature. Don’t get so caught up in the technical aspects of your work that you forget to stop and appreciate the wonder around you. Your natural curiosity will cause you to notice things that you might otherwise pass by if you were preoccupied. So, slow down, relax and enjoy yourself. Notice and appreciate the little scenes along with the big ones. A heightened state of mind will reflect in the quality of your work. “Storm’s a’Comin’”, Sept.30, 2017, Canadian Rockies. Canon 24-105mm f/4L lens, 35mm, ISO 200, f/8, 1/200 sec. We all have a preferred method for working in the field, or a favorite lens we always pull out of the bag first. If you are in a rut and making the same types of compositions, try doing something different to shake things up. If you typically shoot with a wide-angle lens, try using a telephoto for a while. If your compositions are usually horizontal orientation, try flipping your camera to vertical and observe what kind of photographs you begin to create. Putting aside habit with self-imposed restrictions can help you to see differently and spur creative thinking. Loosen up and allow yourself the joy of playfulness. Let your personal sense of fun lead you to new styles with your photography. Make the process one of discovery, even adventure. “Ready for Winter”, Nov. 7, 2015, Yosemite National Park, California. Canon 5D Mark II, Canon 70-200mm f/2.8L lens, 200mm, ISO 100, f/16, .4 sec. Take note of the quality of Autumn light. This time of year, it’s not just the trees that are changing color. The light is also changing. Autumn light is very different from other seasons. The position of the sun in the sky is lower this time of year, which, in turn, alters how the landscape appears. At the Summer solstice in mid-June, the sun is as far overhead as it will travel. But, just past the solstice, the sun begins to hang lower on the horizon. At that point, the angle of light rapidly changes from day to day as the sun races toward its Winter midpoint. The farther North you are from the equator, the more oblique the angle of the sun’s light. Unlike the Spring equinox, when the angle of the sun is the same as the Fall equinox, the days tend to be warmer in the Autumn. So, by this time of year, the steep angle of the sun combined with atmospheric conditions results in a quality of light that basks the landscape in a golden glow. 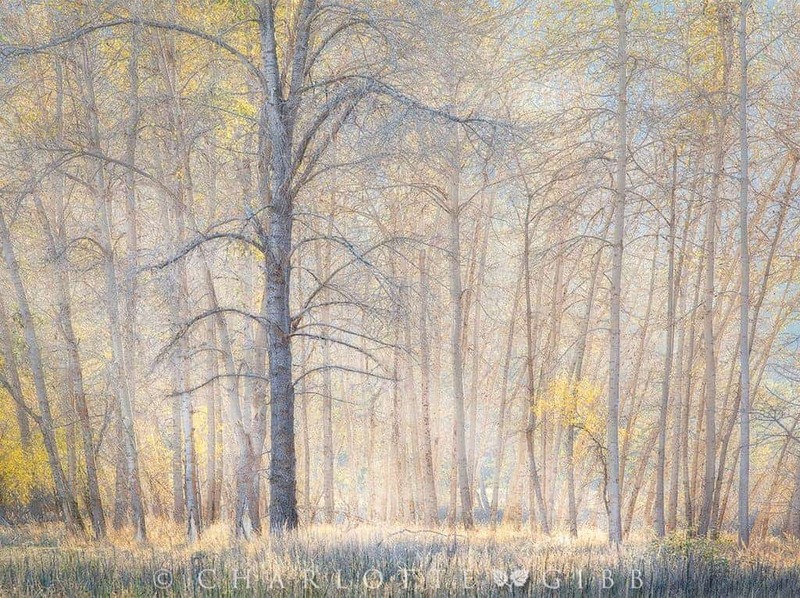 Impressionist painters were keenly aware that light had unique color qualities depending on the season, and they strove to emphasize accurate depiction of it. Claude Monet was particularly fascinated with painting the same subject repeatedly during different seasons and times of the day. His aim was not to portray a physical object, but to communicate the actual quality of the light. 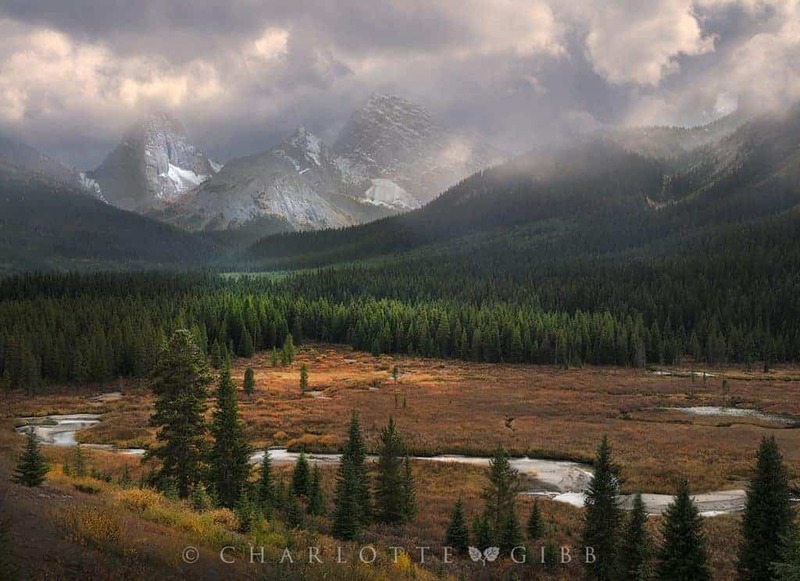 As photographers, we can also illustrate how the character of light changes the way we perceive the landscape. Emphasize long shadows. If mist is present, notice how the light travels through it in low, slanted beams. Photograph trees as the light first illuminates the tops of the trees, or as the last of the day’s sunbeams kiss them goodbye. Take note of the color of the atmospheric haze and work it into your composition. “Along Rush Creek”, Oct. 20, 2016, Eastern Sierra, California. Canon 5DsR, Canon 24-105mm f/4L lens, 32mm, ISO 100, f/16, 1/10 sec. At a time when photos are typically judged individually on Facebook or Instagram, a series can tell a bigger story than a single image. Project-oriented photography can unlock potential creative energy by infusing an idea or concept before you ever click the shutter. Certainly, projects can emerge from a group of photos after the fact in the editing process, but a purposeful approach to creating theme-based imagery is usually more powerful and can set your work apart. Invent a framework for your subjects, and the process will naturally follow. Rather than fashioning your shots in order to tell a story, let the story tell you when to shoot. Follow your native curiosity about a place or subject, as you might choose a less-worn path. It can lead you to something magical, perhaps something you’ve never seen before. If you run out of trail, a familiar road is always just a few steps away. Be open to getting a little lost and see where you find yourself. 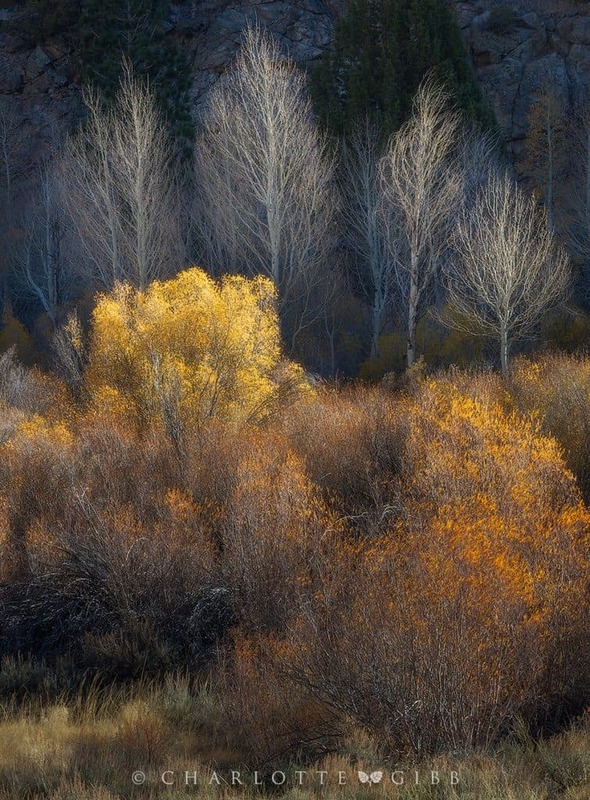 “Autumn Aglow”, Oct. 21, 2016, Eastern Sierra, California. Canon 5DsR, Canon 70-200mm f/2.8L lens, 170mm, ISO 100, f/14, 1/20 sec. It's okay to take bad photographs. I hereby grant you permission to make terrible photographs. No, really. It is an important part of the process. Autumn foliage can overstimulate your visual sense so that you can’t even decide where to point your camera. Sometimes it helps to knock out a few bad compositions to settle into the feel of having the camera back in your hands. It might take a few misbegotten frames before you can start zeroing in on what is the essence of the scene. In a recent workshop, one student turned to me and said that he couldn’t see any compositions in the scene we were photographing. I urged him to point his camera at a grouping of trees that were in front of us. He made an uninspiring composition. Then, I asked him to look for the most interesting part inside that frame. He noticed a series of holes in the trees. I asked if he could try a different lens and arrange the elements in a way that would be more interesting. After making a few less interesting frames, he eventually created a winning and compelling composition. Making beautiful art can be messy. Autumn is a wonderful time of year to tap into your creativity. Wherever — and whatever — you choose to photograph, have a wonderful time and savor this annual gift of color. Winter will be here soon enough, and then we will all be talking about the photographic virtues of frozen forms of water. “Last Sunset”, Oct. 20, 2017, Eastern Sierra. Canon 24-70mm f/2.8L lens, 42mm, ISO 100, f/16, 1/8 sec. “Fall Whisper”, Nov. 3, 2015, Yosemite National Park, California. Canon 5D Mark II, Canon 70-200mm f/2.8L lens, 135mm, ISO 100, f/20, 1 sec. 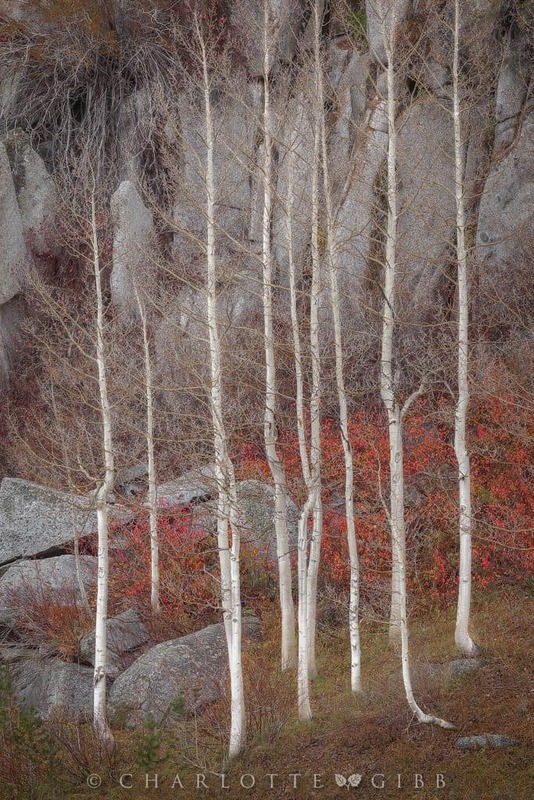 “Sentinels”, Oct. 15, 2015, Eastern Sierra, California. Canon 5D Mark II, Canon 70-200mm f/2.8L lens, 190mm, ISO 100, f/16, .4 sec.